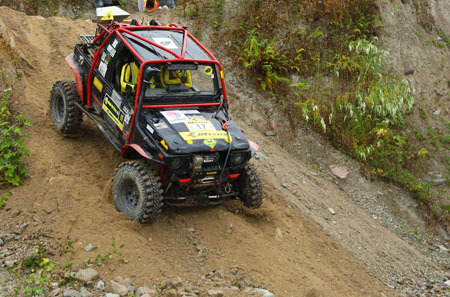 DAMBUK, Dec 18: The Manabhum Off-Roaders Club of Arunachal (MOCA) displayed strategic acumen and nerves of steel to claim the JK Tyre Orange 4X4 Fury title here in Lower Dibang Valley district on Tuesday. Going into the fourth and final day, with just 5 points separating them and defending champions Gerrari Off-Roaders, the local favourites won the day’s first and played it safe in the second to post their biggest victory on the national stage. The MOCA team, led by drivers Aditya Mei and Chow Ujjal Namshum and guided by co-drivers Chow Sujeewan Choutang and Chow Ingieng Mein, went all out in the Camp the River stage to collect 100 points. Their main challengers, the Gerrari Off-Roaders, finished third for 90 points but suffered a big blow when they were penalized 30 penalty points for breaking a bunting. Team Chandigarh, powered by Gurmeet Singh (with Gurpratap Sandhu as navigator) and Kabir Waraich (with Yuvraj Singh Tiwana), gave it their best shot but that one mistake proved to be their undoing. They won the final Dambuk River stage to collect 100 points, but the battle had already been lost. They, however, had the consolation of winning the first runner-up trophy and Rs 1.5 lakh. The deserving champions picked up the glittering winners’ trophy as well Rs 2.5 lakhs for their efforts. The second runner-up team from Bangalore, BODA, was richer by Rs 1 lakh. “We stuck to our overall strategy of avoiding penalty points at any cost,” MOCA’s Aditya Mei said shortly after winning the title. “We worked well as a team, which was perhaps easy because we are all from the same family,” he added. The eldest cousin of the foursome, Chow Ujjal Namshum, conceded that they were tense on the eve of the final run but quite confident of doing something special. “Once we picked up a handy lead after the day’s first stage, we knew we had to do,” he said. The winners, who are planters by profession and took up the sport as a hobby, are all cousins. They began competing in 2012 just for fun, before it became their calling in 2015. They now aim to participate in the Rain Forest Challenge.